"Sampath Speaking" - the thoughts of an Insurer from Thiruvallikkeni: using technology ! ~ delayed DRS .. .. forgetting stump mic !! using technology ! ~ delayed DRS .. .. forgetting stump mic !! Often Vadivelu’s comedy scenes are hilarious and deliver sense .. .. his comedy dialogues become ‘catch-words’ like : ‘வட போச்சே!’; மாப்பு வெச்சுட்டான்யா ஆப்பு; ‘நடுவுல இருக்குற கம்பியை மறந்துட்டேனே’; ‘உனக்கு வந்தா ரத்தம், மத்தவங்களுக்கு வந்தா தக்காளி சட்டினியா? ’; ‘மண்டையில இருக்கிற கொண்டையை மறைக்கலையே ! !’ ~ often people tend to forget smaller but significant things and end in agony, as experienced by couple of Cricketers, forgetting the presence of stump-mic. It is not the most recent innovation. The Super Eight match WC 2007 between Australia and the West Indies that was played in Antigua was the first to utilise stump microphone technology in a move designed to make sure that even more decisions made by umpires are correct. That innovative technology was aimed at providing the onfield Umpires hear faint edges too, through the earpieces that were connected to stump microphones. That has provided entertainment for some, horror for some ! More recently, attention has been focused on technology and data-driven insights. Some have been great fun. In the Big Bash League in Australia a few years ago, they had displayed a heart-rate monitor when a batsman took guard—a fun way to measure the otherwise unquantifiable stress levels out in the middle. Tim Paine's chat behind the stumps was not seen as sledging but more of a banter, something hilarious. From sledging Virat Kohil, giving it to Rohit Sharma and asking Rishabh Pant to babysit his kids, Paine was in fine form. Little Rishab Pant matched him word by word, calling him a temporary Captain, later visiting his house for baby-sitting ! Amit Bhandari had figures of 7.4-0-31-3 yet never played for India after that match against Zimbabwe. Earlier, he made a forgettable one-day debut against Pakistan in the Asia Cup at Dhaka in 2000, smashed for 75, got two wickets and didn't play for another four years. He was brought back for a solitary game against Zimbabwe in 2004 and never played for India again. He is in news now, as he was attacked by men wielding hockey sticks and iron rods during a cricket match at Delhi's St Stephen's Cricket Ground on Monday. Bhandari, who suffered head and ear injuries, was watching a selection trial game with two other selectors at the time. He was taken to a city hospital immediately, and Dedha, whose actions were reportedly in retaliation for not being selected in the Delhi Under-23 team, as well as one of his accomplices were arrested. A life ban has been recommended for Anuj Dedha, the Delhi cricketer who assaulted Amit Bhandari, the former India bowler and now chairman of selectors for Delhi's senior and Under-23 teams. The recommendation to ban Dedha was taken at a Delhi & District Cricket Association (DDCA) meeting attended by its president Rajat Sharma, members of the senior selection panel, the head coach and the team manager. The decision also found support from former Delhi and India opening batsmen Virender Sehwag and Gautam Gambhir. At Stumps today Vidarbha 245 for 6 (Sanjay 65, Wadkar 50*, Karnewar 15*, Gowtham 2-33, Jadeja 2-66) trail Rest of India 330 by 85 runs .. are you following this match ? it is Irani Cup 2019 .. .. .. despite losing only six wickets on the second day, Vidarbha failed to take control of the Irani Cup tie in Nagpur, as their attritional batting kept them 85 runs behind Rest of India's 330 when play ended. The Z. R. Irani Cup (earlier called Irani Trophy) tournament was conceived during the 1959-60 season to mark the completion of 25 years of the Ranji Trophy championship and was named after the late Z. R. Irani, who was long time treasurer. The scheduling of India’s domestic cricket has sparked controversy yet again. The staging of a tournament like Irani Cup after the 2018-19 Ranji Trophy has earned a lot of criticism and the performance displayed by the players during the first-class match also did not convince many. Defending Ranji champions Vidarbha, who won their second successive title this year, took on the Rest of India (ROI) in Nagpur without two of their premier players – Umesh Yadav and Wasim Jaffer – both of whom were in great forms this season. It was suspected that with the Indian Premier League (IPL) and World Cup lined up over the next few months, the ROI players were not too interested to take the long-format game seriously and succumbed to playing far too adventurous shots that are unsuitable in four-day games. In 2012 ROI piled mammoth total against Rajasthan. Murali Vijay batted to glory, reaching the highest individual score (266) in the tournament's history, beating a 22-year-old record held by Praveen Amre, to pretty much ensure the Ranji champions would be denied the Irani Cup for a seventh year in a row. Way back in Nov. 1990, against Bengal, ROI had declared at 737/7 with Ravi Shastri the captain making 217 and Pravin Amre made 246. The one match we would ever remember is that of Oct 1988 which brought VB Chandrasekhar into National reckoning. ; that remains the only Tamil Nadu ever won Irani Cup. ROI captained by Arunlal made 433 with good contributions from IB Roy 60; Navjot Sidhu 86, Srikant Kalyani 93; Jeshwant 62. S Vasudevan took 5 for 116. Krish Srikkanth leading TN made 57 and TN were all out for 226. Gopal Sharma took 6/69. ROI made the blunder of batting again and this time were shot out for 132 in less than 50 overs with Vasudevan taking 4 and Krish Srikkanth taking 3 for 14. Chasing a target of 340, Srikkanth and VB Chandrasekhar plundered at will and TN made the required runs in 79 overs brining out a remarkable victory which remains etched in memory. Hirwani and Gopal Sharma were hit to all parts of Chepauk as VB played a great knock. At Kingsmead, an apparent DRS timing error may have cost Sri Lanka a wicket on the first morning. Two balls after he had Dean Elgar caught behind in his first over of the day, Vishwa Fernando rapped Hashim Amla on the pads to spark a confident appeal for lbw. Umpire Aleem Dar was unmoved, and after a short discussion Sri Lanka captain Dimuth Karunaratne asked for a review - but Dar turned down the request on the basis that the visitors had taken too long to ask for it. Section 3.2.2 of the ICC's Test playing conditions stipulate that: "The total time elapsed between the ball becoming dead and the review request being made shall be no more than 15 seconds," and "If the on-field umpires believe that a request has not been made within the 15 second time limit, they shall decline the request for a Player Review." According to the commentators on the SuperSport broadcast of the game, only 13 seconds had elapsed when Karunaratne asked for the review, and the TV umpire Ian Gould would have been in charge of timing the 15-second interval between the ball going dead and the review time limit. Had they been able to take the review, Sri Lanka would have had South Africa wobbling at 0 for 2 as replays showed that Amla would have been out lbw. Gabriel was charged with a Level Two offence under article 2.13 of the ICC's Code of Conduct, covering "personal abuse". There was no formal hearing with the match referee, Jeff Crowe, after he accepted the charge. 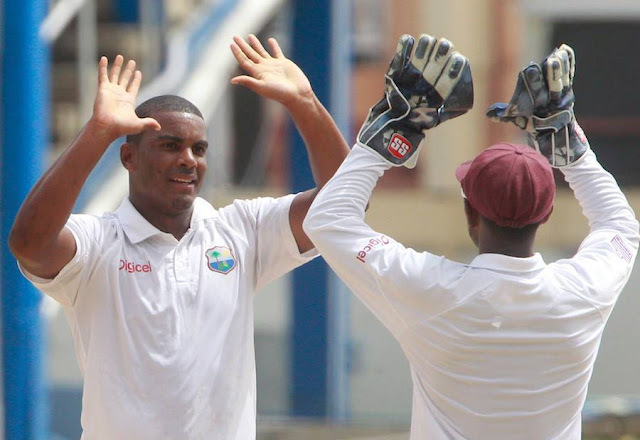 Although Gabriel was not in the original squad for the first two ODIs against England, he is understood to have been lined up as an injury replacement for Keemo Paul. The comment at Root was picked up by the stump mics while batting on the third day responding to an unheard comment from Gabriel. "Don't use it as an insult," he said. "There's nothing wrong with being gay." The incident was dealt with at the time by the on-field umpires but Gabriel was charged the following day after the footage received widespread attention. Root said at the close that things said on the field "should stay on the field", but nevertheless received praise for his stance, including from UK equality charity Stonewall. Speaking on Wednesday before the news of Gabriel's ban, England coach Trevor Bayliss repeated his feeling that stump microphones should be turned down between deliveries. As well as Gabriel, Pakistan's Sarfraz Ahmed was last month given a four-match suspension for making a racist remark remark that was picked up by the TV broadcast. Sarfraz met Phehlukwayo later to apologise for his remarks, which included the Urdu word “kaale”, meaning “black”. Sarfraz posted a picture of the meeting on Twitter, writing: “This morning I apologised to Andile Phehlukwayo and he was gracious enough to accept my apology and I hope the people of South Africa also accept my apology.” The ICC added that Sarfraz will now undergo an education programme relating to the offence, while the Pakistan Cricket Board remains unhappy with the decision despite Sarfraz’s apology.